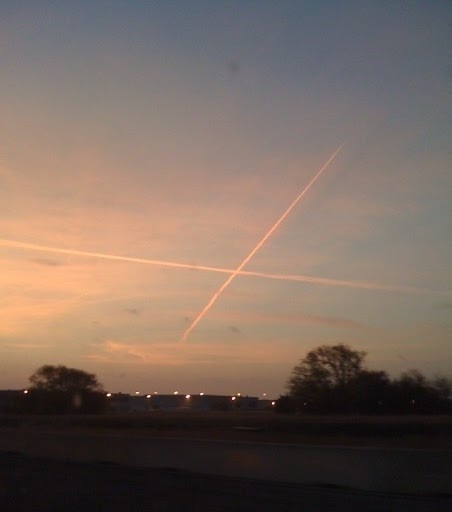 jet trails over DFW Airport? You've heard of chlorophyll, no doubt, but have you heard of xanthophyll? Xanothophyll is a substance causing the yellow color of autumn leaves. The yellow coloration is masked by the presence of chlorophyll, and xanthophylls are only revealed when chlorophyll is degraded as the plant heads into dormancy. These yellow pigments are also observed in leaves with certain nutrient deficiencies, such as chlorosis. Thankfully I did not have a lot of examples of chlorosis in my garden, but I did find these chlorotic 'Nana' Nandina leaves that were certainly showing off their xanthophylls. The picture below shows how Nandina foliage should look in the winter. Also from the combining word xantho (Greek xanthos, meaning "yellow"), we get Xanthocarpous, which means "having yellow fruit," and Xanthospermous, which means "having yellow seeds." Xylem means the "woody portion of a plant." X is also for Xenolith, "a fragment of extraneous rock embedded in magma or another rock." I wonder if these might be considered examples of xenoliths in a few of my garden rocks. 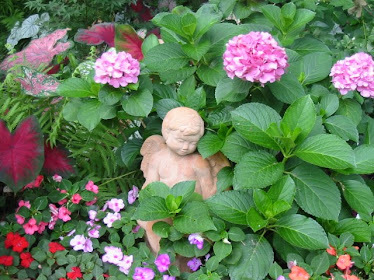 Xiphophyllous means "having sword-shaped leaves." Do you think the leaves of this Red Cordyline and the Hymenocallis 'Tropical Giant' fit the bill? And, yes, from the combining word xero (Greek xeros, meaning "dry"), we get all kinds of garden terms, not the least of which is our old friend Xeriscape. 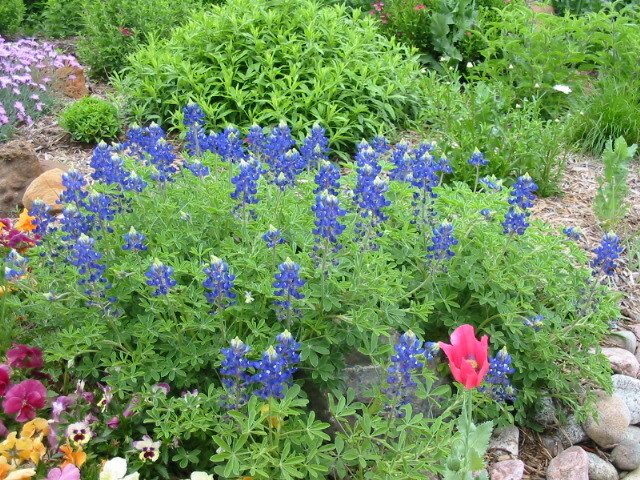 Xeriscaping is "a method of landscaping that uses drought-resistant plants that are well adapted to a local area. 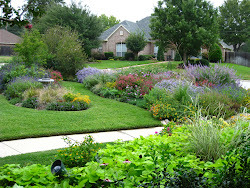 Xeriscaping is often used as a water conservation strategy." Since I do supplemental watering of my garden, I am not sure it would qualify as a true xeriscape garden, but I do use "drought-resistant plants that are well adapted to my local area." Xeric means "dry; lacking in moisture." Xerothermic means "dry and hot." Xerophilous means "growing in or adapted to especially dry and hot regions." 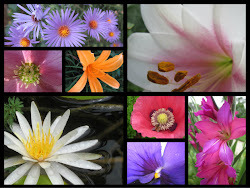 Xerophytic means "able to withstand drought." Xerophobous means "unable to survive drought." Every summer in Texas is xeric and xerothermic, and most of my plants are xerophilous and xerophytic. But during the extremely xeric summer of 2011, I thought I was becoming a little xerophobous at times! A new plant that I added to my garden this spring is called Spreading Japanese Plum Yew, Cephalotaxus harringtonia 'prostrata.' I love its fine-textured, soft green foliage. I have a sweep of the yew planted below my Shumard Red Oak and in front of Turk's Cap. 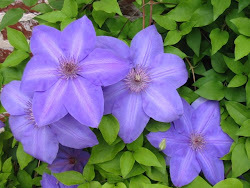 Since it was just planted this last spring, right now it is growing very close to the ground and is only 2 to 3 feet wide, but it will eventually grow to about 2 feet tall and 5 feet wide. The goal is that it will grow just tall enough to grace the top edge of the boulders to soften the hardscape. Y is also for YOU! 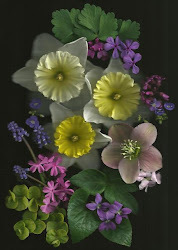 As my first full year of garden blogging draws to a close, I just want to say thank you to all of YOU for visiting my blog and leaving your encouraging comments. I have enjoyed getting to "know" so many of you through your blogs and have even had the pleasure of meeting (in person) Karen & Carl from Quarry Garden and Larry & Sarah from Conrad Art Glass & Gardens on a visit to Wisconsin this summer. 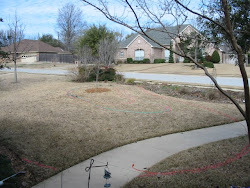 I am looking forward to another year of blogging about this little plot of land I have been given the blessing to care for, and I hope you will continue to join me on my garden blogging adventures in the new year. Speaking of xeric plants, let me sing the praises of this native Texas plant once again before the year is out. If there was ever a summer for this plant to show its stuff, it was the summer of 2011 for sure! Tiny bright yellow blooms cover this extremely drought-tolerant plant all summer long. my Japanese maples have come to a colorful conclusion this year. I was concerned that the heat and drought would take its toll on the maples this year. A couple of the maples went into early dormancy and dropped leaves early, but most of the trees put on a great show despite the difficult summer they endured. and my collection grows in number. 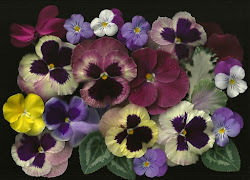 Three new varieties were added to my garden in the past year. Last December I added Peaches & Cream, in the spring of this year I added Shaina, and this fall I added Tamukeyama. Unfortunately Peaches & Cream lost its leaves early this fall, but then when the temps cooled down a bit and we got some rain, it tried to rebound and started putting on several new leaves again. Here's a picture of "spring" leaves in the fall (and notice the crispy leaf, as well). Shaina is an upright dwarf variety that will only grow about 5 feet tall and wide. It has red spring and fall color. The latest addition is Tamukeyama. I got this variety just because the name is so fun to say :-) Tamukeyama is a weeping dissectum variety that will eventually grow to 8 feet tall and 12 feet wide. Red spring color changes to green during the summer. Here is Tamukeyama shortly after planting in October. (with Oshio-Beni and Red Select in the background). Here are some of the other maples dressed in their autumn color. Mikawa Yatsabusa were transplanted last winter, but both adjusted to their new home without any trouble. Red Emperor holds its color well through the summer. I have great friends, huh?!! I have 23 Japanese maples in my collection as of now. that I might just be addicted to Japanese maples! And you thought Kay Jewelers had the corner on this market, didn’t you? 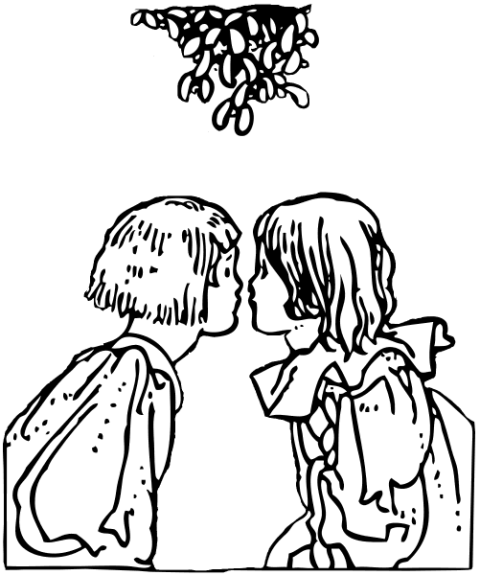 There are several theories on the origin of the tradition of kissing under the mistletoe. One theory dates back to ancient Norse mythology. The Reader’s Digest version of the story is that the son of the goddess Frigg was killed with a spear made of mistletoe. When the son, Baldr, was brought back to life, Frigg declared that from that point on mistletoe would bring love rather than death into the world. People kissed under the mistletoe to remember Baldr’s resurrection, bringing the promise of happiness and good luck in the following year. Folklore abounds when it comes to mistletoe. Another legend dates back to the ancient Babylonian-Assyrian Empire where mistletoe was hung outside the temple for the goddess of beauty and love. Mistletoe was also seen as a supernatural healing plant, and the Greeks believed it to be an aphrodisiac that promoted fertility. It was even put under the beds of newlywed couples to bring good luck. In Scandinavia, mistletoe was considered a plant of peace. Under the peace-promoting plant, enemies could declare a truce or warring spouses would kiss and make up. In Europe, branches of mistletoe were hung from ceilings to ward off evil spirits. 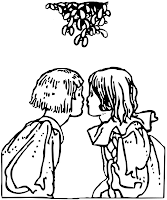 In England young men would kiss women standing under the mistletoe and would pluck a berry from the bush after each kiss. After all the berries were gone, it was bad luck to continue kissing under that bush. With all that love, peace, and kissing attributed to the mistletoe, you’d think everyone would be clamoring to have one or two. But this is where the romance ends, my friends. The Old English (Anglo-Saxon) word for Misteltoe was mistiltan -- "Mistel" meaning "dung" and "tan" meaning "Twig", i.e., "Dung-on-a-twig." Not so lovely anymore, is it? Mistletoe produces a white berry that is part of the diet of many birds. The seeds are coated with a sticky gelatinous substance. When the seeds are excreted in bird droppings, the seeds stick like glue to twigs and limbs until they germinate. When the mistletoe seeds germinate, root-like structures called haustoria penetrate the bark and grow into the xylem (the water conducting tissue of the tree limb.) Mistletoe is a parasite that lives off the tree as its host. The water and nutrients needed for its growth and development are taken from the tree’s sap. Small limbs infested with mistletoe can be pruned. Limbs must be cut at least 12 inches beyond where the mistletoe attaches to the limb in order to completely remove the embedded root system. When mistletoe is growing on large limbs or on the tree’s trunk, pruning is no longer practical. Just cut the mistletoe off flush at the point it attaches to the limb or trunk. Only mature plants (2-3 years old) produce berries. You may reduce the spread of the plant if you can remove the mistletoe plant before it reaches maturity and produces seeds. Another option is to cut off the mistletoe plant and then wrap the area with a few layers of black plastic for one to two years. This may be an effective control of the plant, since mistletoe also requires chlorophyll and sunlight in order to survive. Once again, the size of the tree and location of the mistletoe will determine how practical it is to try this technique. Safety first! There is currently no herbicide recommended for the control of mistletoe in trees. Because the mistletoe’s haustoria basically become intertwined with the tree’s vascular system, chemical controls could cause injury to the tree. Some trees seem to be more susceptible to mistletoe. Cedars, junipers, pecan, live oak, and magnolia trees are rarely infected with mistletoe. However water oak, Spanish oak, elm, and hackberry trees are frequently infested with this parasite. So does having mistletoe mean the kiss of death for your tree? Not necessarily. Mistletoe may not kill a tree outright, but heavily infested limbs are stressed, and this can increase the tree’s susceptibility to other problems. Now that the trees are dropping their leaves this winter, the evergreen mistletoe will be very visible. Hopefully you can safely remove it, and you and your trees can kiss this parasite goodbye! I hope the only mistletoe you find this year is the kind that brings a little love, peace, and a kiss or two. We've had perfect weather the last few days. A nice slow soaking rain. What's so perfect about a rainy day in December? Well, for one, the rain is helping to replenish our drought-stricken Texas gardens, although I know we have a long ways to go. And secondly, this wonderful rain is exactly what my spring wildflowers need in order germinate this winter. Yesterday as I strolled through my garden in the misty rain, I was so excited to see the tiny leaves of the poppies, larkspur, and bluebonnets emerging from the dampened soil.